The camera focuses in on what is a homemade time bomb. A young unidentified man carries it to a car placing it inside the trunk. Unknowingly, an American with his bimbo girlfriend gets into the car and drives off. The camera pulls back; we are in a sleazy Mexican border town. The camera follows the car. Coming into the moving camera’s range is Vargas (Charlton Heston), a Mexican police officer and his newlywed American wife, Susie (Janet Leigh). They cross the street heading toward the American side of the border. We pass one bar and strip joint after another; the music, jazz, rock and roll, blaring out from each one. At the border, Vargas stops and talks with the border guards, the two Americans in their car pass through, the girl mumbling something about hearing a ticking sound, but no one pays her much attention. Moments later the car explodes into a fiery ball. With the strategic assistance of cinematographer Russell Metty, Welles frames this opening all in one astounding continuous long running brilliant shot. It’s a spectacular beginning to one of the most interesting works in film noir, made right toward the end of what is generally considered noir’s classic period. The film is also my own personal favorite Orson Welles work. 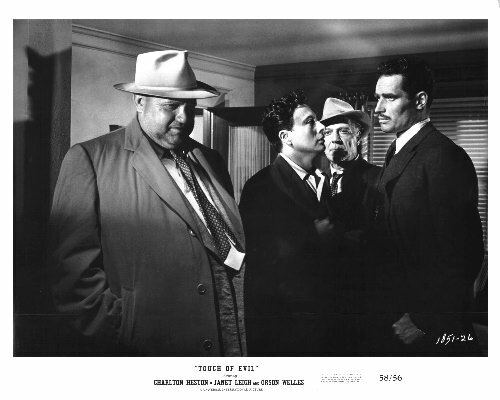 Citizen Kane is certainly a greater work, but for sheer low budget filmmaking Touch of Evil cannot be beat. Released on the top half of a twin bill, at least in New York, the film played at theaters around the city for four days, scaled back to one theater for another three days and quickly disappeared. The answer was no, not yet, but studio head Ed Muhl and producer Albert Zugsmith told Heston, Orson Welles was on board for the film as an actor in the small role of a corrupt cop. Heston wanted to know why Welles wasn’t directing. I imagine some coughs and “ahem” moments must have occurred before the studio bosses responded. As many know, Welles had a reputation for over spending and doing movies his way. Still, Universal did not want to lose Heston, who just finished playing Moses on screen, and after all who wants to piss off Moses? They offered Welles the job to direct and even let him rewrite the script with the caveat of no extra pay. Welles jumped at the chance in what would turn out to be his last Hollywood directing assignment. The first thing Welles did was rewrite the script, with Heston’s blessings. They became friends and Heston’s support during filming certainly helped Welles with the politics of Hollywood. Heston liked the improved script even with the many modifications including changing Heston’s character to a Mexican police officer named Vargas, from an important family, and relocating the action along the U.S./Mexican border (in the novel the setting was San Diego). Vargas’ wife, who was Mexican in the novel, became an American with the All-American name of Susie. The changes were so extensive Welles received sole screenplay credit. 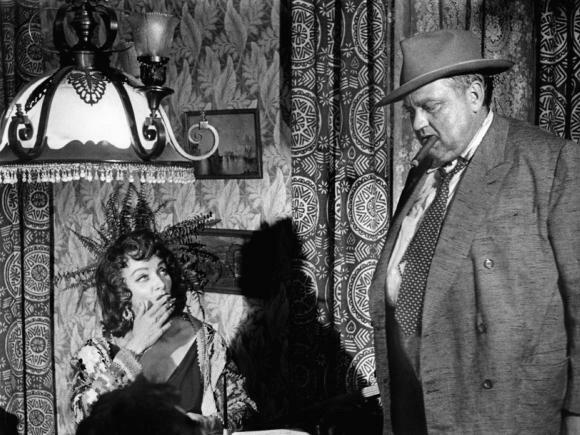 Welles also increased his own role in the film making the story more about the rise and fall of his corrupt character, Captain Hank Quinlan, than about Heston’s Mexican police official. Location shooting was done in Venice, California since Universal would not spring for the money to shoot in Mexico and wanted to keep a close eye on Welles which was easier if filmed in the States . Welles found enough dilapidated, low class buildings in Venice, California to substitute convincingly for the border town in the film. Based on a novel by Whit Masterson, the first version of the screenplay was written by Paul Monash. It was this version of the script that was sent to Heston and would soon after be revamped by Welles. Hank Quinlan is not so much a crooked cop as he is a cop who does not go by the rules. If there is no proof and his gut tells him the suspect is guilty, he’ll manufacture the proof to complete investigation. When Vargas, a straight, by the book, cop of obvious good breathing begins to question Quinlan’s methods and attempts to bring him down, Quinlan sets in motion a plan to get back at Vargas by going after his young and virginal looking new American bride. In Welles hands, the film became more than just another cop story as Heston feared it would before the egotistical master’s involvement. 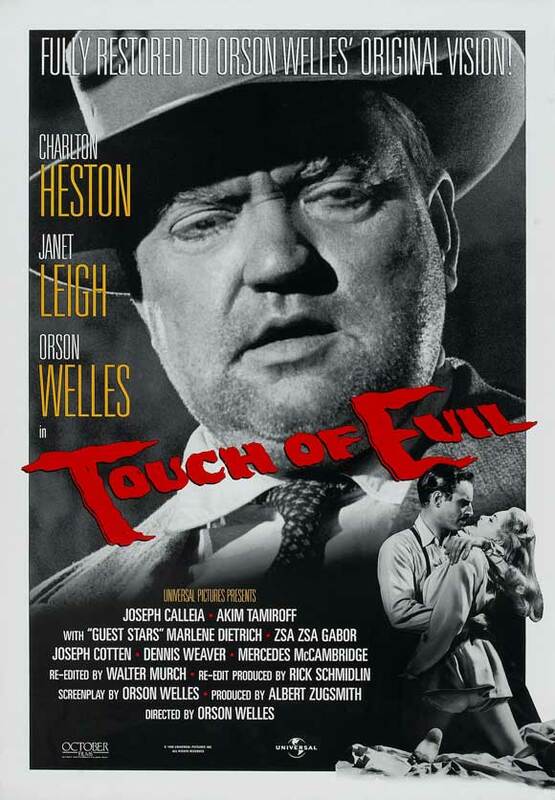 Welles turned”Touch of Evil into the rise and fall of Hank Quinlan, a onetime well admired cop respected for his intuitive investigative skills. Now nothing more than a grandstanding alcoholic blowhard willing to frame a suspect with falsified evidence to get a conviction and prove he is still the man he once was. The end result of it all is a dark, dirty crime film that clarifies many of the murky questions asked, but left unanswered in the earlier chopped up versions. Welles does not spare himself. His Hank Quinlan is a unkempt, overweight, beastly looking character. Visually, he made himself grotesque, at one point placing the camera at a very low angle in front of a car as his character Quinlan lifts he massive body up and out of the car so we get the full brunt of his size and hideous clothes right in our face. 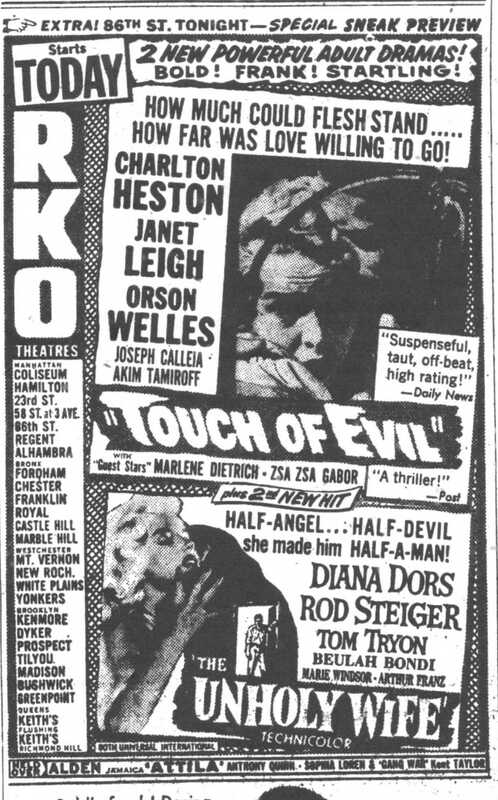 This entry was posted in 1950's, Film Reviews, Janet Leigh, Orson Welles, Twenty Four Frames Favorite Films and tagged Akim Tamiroff, Charlton Heston, Dennis Weaver, Film Noir, Janet Leigh, Joanna Moore. Marlene Dietrich, Joi Lansing, Joseph Calleia, Orson Welles, Russell Metty, Touch Evil, Zsa Zsa Gabor. I LOVE THIS MOVIE!! I was fortunate enough to never seen this movie until 1998, so I have only seen this brilliant film in all of Orson’s splendor. Not only is it one of my favorite film noir of all time, it is one of my favorite movies period! Orson Welles does so of his best acting as well as directing, Janet Leigh, Charlton Heston, Zsa Zsa Gabor are great too, but Marlene Dietrich is the screen stealer for me. 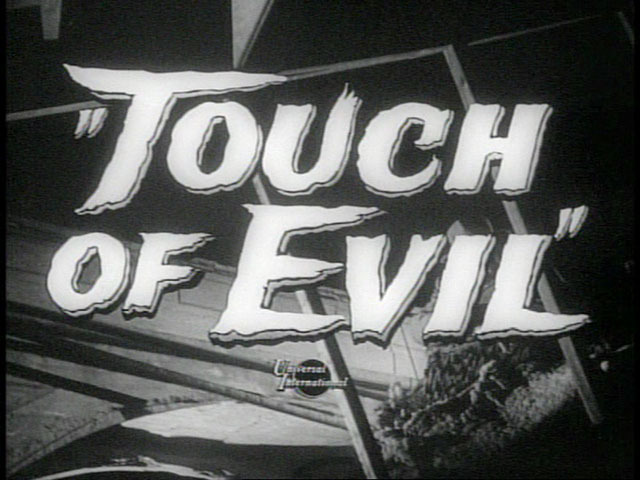 You have made me want to cancel all my plans today and watch “Touch Of Evil” instead. Really what could I have been doing that would have been more important anyway? This is my favorite Orson Welles film. CITIZEN KANE may be his greatest achievement but on any given day for pure pleasure this is my pick of his films to watch. Thanks! 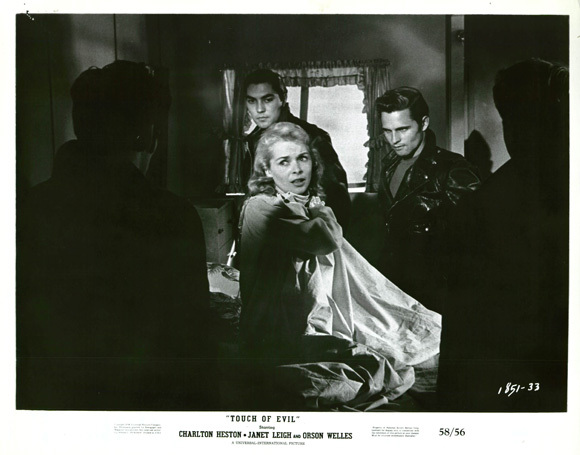 Alone, in the dark, seeing “Touch of Evil” for the first time I stood and cheered in the middle of my living room. If he were here, and I could get my arms around him, I would give Orson Welles such a hug for such a movie! Heston too! Acting honours to Joseph Calleia who breaks my heart. I agree Patricia, Joseph Calleia role was heartbreaking. Thanks again for stopping by. Fantastic post! I didn’t know all the background info to this movie – that in itself could almost be a movie. I love how, as you pointed out, Welles makes no attempt to “beautify” himself. It brings truth to his role. SS – Glad you enjoyed it. Welles went all out to make this film and the studio just ripped it away from him. Sad that he did not get to see his vision finally realized on screen. That is sad. I can’t imagine how frustrating that would be!! John, I’m a big fan of “Touch of Evil,” a most interesting film that you’ve covered very well here. I’m not Charlton Heston fan (at all), but he works just fine as Vargas. Thanks Eve! I am not that big a fan of Heston either. Not even sure why that is but in this film i think he is just miscast as a Mexican. Agreed. I’d like to have seen someone else as Vargas (and there were so many greats to choose from at that time), but I’ve gotten used to him over the years. This is my favorite Welles’ film. The scene where Tamiroff gets it in the seedy hotel is so well done. Note the sign on the door that tells patrons to make sure you take all your things when checking out. Of course, Quinlan leaves an incriminating clue. Anyway, it’s a thrilling experience the first time you watch it. Nice write up. For me this film is always a treat to watch. Magnificently staged and lit. High up on my own list of best and mos watchable films. Great and informative post. I love this film – really gripping. Not a big Heston fan, but I can tolerate him in this. Thanks FlickChick, Looks like a few of us are in agreement about Heston. John, another great post on a film so good it would intimidate most bloggers. I loved the film in its original version, but the re-edited version from the late 90s is even better, the swan song of classic film noir. I especially liked your comments on the character Orson Welles plays, Hank Quinlan. He’s the kind of tragically flawed character–a man who did bad things to achieve what he thought of as good ends, and ended up corrupting everything he touched, including himself–that fascinated Welles and that, after playing Charles Foster Kane, he understood so well. Like others who have commented, I’m not a big admirer of Heston, but he did give an earnest performance, he didn’t pull any star ego tricks to try to dominate the film, and it’s undeniable that without him the film probably never would have been made. From interviews with him and others, I get the impression that he was elated to be working with Welles, whose filmmaking genius he admired and that he did everything he could to be co-operative. You absolutely right about Heston being delighted to work with Welles. Once orson became involved he increased his own role and Heston had no problem at all with it. There was no ego tricks on his part and I give much credit to Heston for helping Welles with the studio who really did not want him to direct. Thanks again R.D. for you thoughtful comments. Be it the spectacular opening sequence, the grimy content, the moody look or Welles’ fantastic turn as the grotesque cop, this was an incredible film from start to finish. This also is my favourite Orson Welles film (yes, it tops the much celebrated Citizen Kane for me). The only glitch in the film, unfortunately, remains Heston’s ludicrous make-up. Great write-up on this marvelous noir, John. Thanks and I am in agreement with you. As much as I admire Citizen Kane as the masterpiece that it is, I too favor this film as the Welles film I most want to watch. Fantastic stuff John. Well done. This too is my favorite Orson Welles film. I love the roughness of it and the uglyness, and somehow this makes it all the more alluring. I would have a hard time convincing someone it’s a better film than Kane, but that’s not my point. It’s just my favorite. I also think that Welles here gave his best performance. It’s nuanced in so many ways and somehow he’s able to make this ugly character somewhat sympathetic, to the point that I’m actually saddened by his death at the end. Fascinating. I think if I was asked to pick my favorite film noir, this just might be the one. I am on board here with you Jon. It’s one of my favorite noir for sure. Welles performance is both stunning and gut wrenching. A film I came watch repeatedly and never get bored. Thanks! I had heard of this film for years………then about five years ago Film Forum here in NYC ran a new restored print, and I mean re-cut per Welles…..worst part of the film was the fact that sitting directly in front of me was Spike Lee, his mouth never stopped moving and any attempt to silence his incessant comments to his friend were met with…….lots of Bronx verbiage. My favorite Welles film and the re-cut Welles version is definitely the way to go. My only complaint is the miscasting of Heston, but to get the film made, Welles needed a big name and he was it. were remarkable….but,and here is the big BUT………..that beautifully fluid shot would not have been possible without a very special piece of equipment……….so special in fact that thirty years before ‘Evil’ DP Hal Mohr, and Director Paul Fajos had built to their design a very special huge crane to be utilized in Universals first major musical…Broadway; (1929)…filmed on a special stage (number 12) to be able to support it, and the heights needed for its movement. This crane was also utilized by Director Louis Milestone for ‘All Quiet On The Western Front’…the crane was called The Broadway Crane……….because of it’s initial use. It is my contention that this crane left mostly un-used on the back lot at Universal was pressed into service on ‘Evil’ and did yeoman service on the picture. Interesting thought and certainly very possible. The shot itself, no matter what was used, is one of the greatest acheivements in filmmaking. Hopefully what you suggest here can someday be answered for certain. Welcome andf thanks! Well John, I gots to know about this shot, and will have to attempt to get production stills from behind the camera. Stay tuned, and as Jack Lord loved to say………….”count on it Danno”……………. Please let us know Neil when you find out! Hear. Hear. Loved the back notes that you provided.